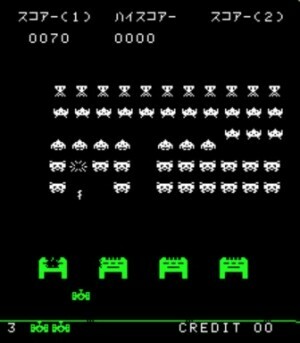 Move your tank back and forth along the bottom of the screen and shoot endless waves of aliens marching towards earth. Shoot the flying saucer for extra points. Move your base left or right to shoot the endless waves of aliens marching towards earth. There are four buildings (shields) that you can hide behind, but eventually they will be destroyed either by enemy missiles or by the enemies themselves. The aliens’ descent quickens as you eliminate them. Shoot the flying saucer for extra points.